The heat was on at the biggest culinary competition in New Zealand when 500 secondary and tertiary students took over Wintec’s Centre for Hospitality kitchens during the 2018 Waikato Culinary Fare. 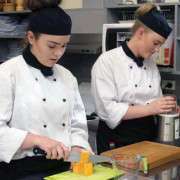 Te Awamutu College hospitality students impressed judges, with one Year 13 student, Morgan McKenzie, winning the Waikato section of the National Secondary Culinary Challenge. The challenge was to present an entree using tomato as the ‘hero’ of the dish. Morgan made leek pancetta and semidried tomato tortellini served on a creamy basil tomato sauce with a parmesan wafer and basil emulsion. The event, in its 14th year, promotes cooking as a career and aims to nurture young talent by providing a culinary competition platform for secondary school and tertiary students. 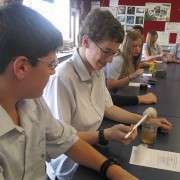 This year it attracted students from Wintec, Toi Ohomai and New Zealand Management Academies as well as students from 25 secondary schools. As Morgan McKenzie won the Waikato section of the National Secondary Culinary Challenge, she qualified to compete at the New Zealand National Secondary School Culinary Challenge in Auckland on Tuesday, September 4. She took a partner and chose to work with Year 12 student Sam Ashmore, who won gold for her chicken dish. They won a silver award. Hospitality teacher Maree Letford is proud of the students and says the competition in Auckland was fierce. “The students need to show attitude and a hunger to win,” she says. - Chicken dish: Sam Ashmore, gold - NSSCC Regional Event: Morgan McKenzie, gold; Amelia Clayton, silver; Laurissa Venter, bronze.